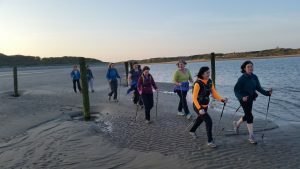 This course is designed to teach the Nordic Walking technique to everyone from those who would consider themselves to be unfit to regular exercisers. The course design and your instructor will ensure that everyone works at their own level of fitness. By the end of the course you will know and be efficient in the Nordic Walking technique and be able to get involved in other regular Nordic Walking events that Sojourns offers. For details contact us or watch our Home page or join on us Facebook. During the summer months Mountain Sojourns offers a 1/2 day workshop which will introduce you to the Nordic Walking technique designed for those of you who are short of time. Once a month we offer Nordic Walks for those of you who have completed a Nordic Walking course with us. These walks are sociable affairs, meeting other Nordic Walkers walking in beautiful areas with your guide who will keep you informed of what is around you and giving you tips on your technique. If you have a group of friends, a club etc. who would like to try Nordic Walking then we can come to a venue close to you. You are invited to contact us with your needs and a competitive quote. If you have a group of friends, a club etc. who would like to try Nordic Walking then we can come to a venue close to you. You are invited to contact us with your needs and a competitive quote. Mountain Sojourns understands that you may not be able to commit to group sessions so we can arrange private tuition at a time and place of your choosing.